The archival news footage above shows the christening of the Arco oil tanker in Maryland. 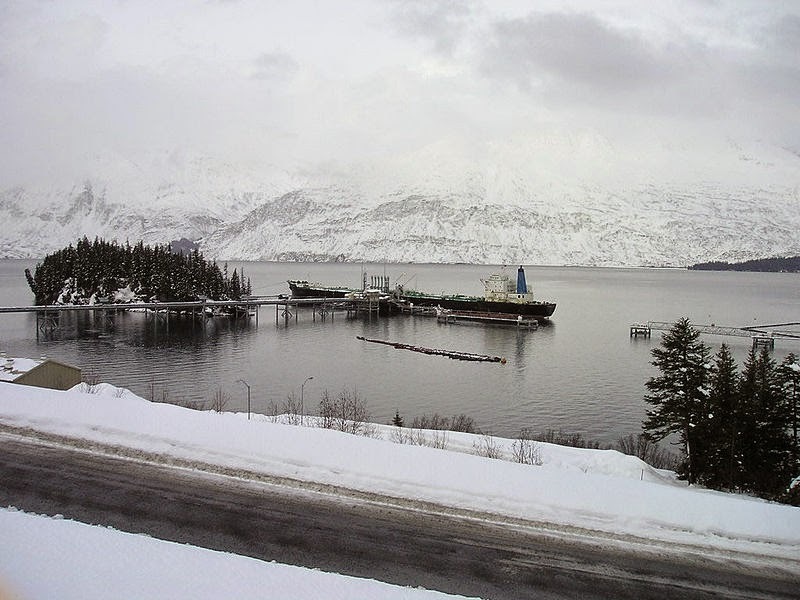 On 1 August 1977, the Arco would be the first ship to voyage from Alaskan waters carrying a load of crude from the North Slope. At a cost of 8 billion dollars the Trans Alaska Pipeline, beginning at the North Slope, was built to connect oil fields in Prudhoe Bay to meet with tankers such as the Arco in a port in Valdez, Alaska. Due to the nature of the Alaskan regional geography, as you can see below, the pipeline runs a serpentine trajectory south through central Alaska. The news footage touts the Trans Alaska Pipeline and the Arco tanker as helping ease a great energy crisis in the United States that emerged due to an embargo placed by the Organization of Arab Petroleum Exporting Countries (OAPEC). According to the historical record, the embargo was in response to US aid to Israel during a war in 1973. By the following year the barrel price of oil increase four times its pre-embargo price to 12 dollars. In the winter of 1973–74 gas station owners placed signs like this up. The ban on trading oil (and its drastic price gouging) gave rise to concerns for the United States' national energy security. "What if the United States ran out of gas?" 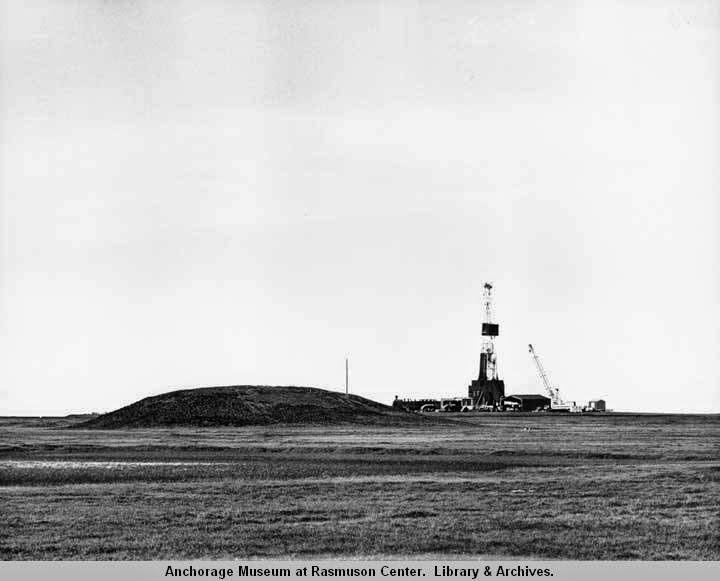 It was this political climate that allowed for the investment of building the pipeline infrastructure across the Alaskan terrain. Oil coming into the national supply from Alaska, it was thought, could surely strengthen energy security. In Northern Alaska among the Prudhoe Bay Oil Fields the crude would be placed in the pipes to cross down through Alaska. Above is a photograph of where the pipeline originates. The oil from Prudhoe Bay has supplied approximately 20 percent of the nation's oil supply over time. Above one can see where the crude 800 miles later after running through the pipeline where it joins the crew of a tanker about to ship out towards a refinery, perhaps in Long Beach, California. 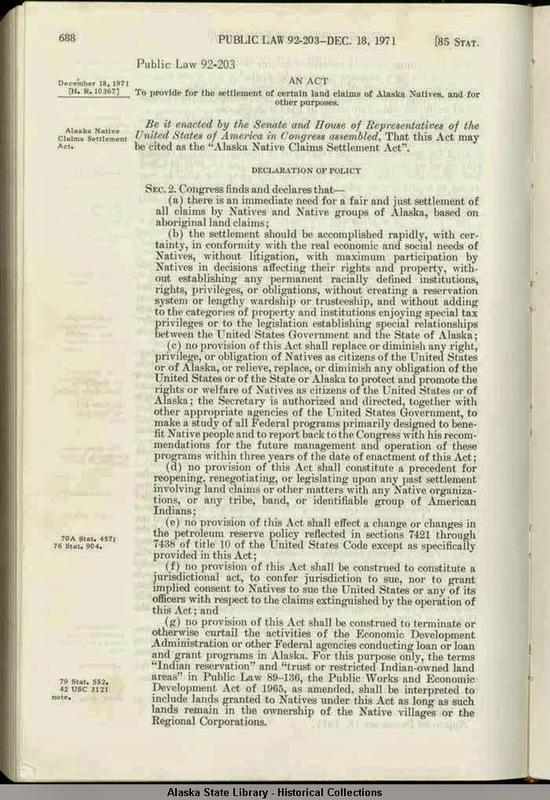 Above is a copy of the Alaska Native Claims Settlement Act of 1971 (43 U.S.C. 1601 et sec). As the largest historical land settlement between the United States and an indigenous people this public law extinguished (in theory) all further Native claims to ownership of land. In doing so the settlement was to clear the way for oil field development, by releasing subsurface rights to state and private ownership, without possible confusion on which party owned the rights to subsurface materials. The nation's energy crisis in the 1970s was solved through the concerns for energy security combined with the Settlement's regulations over subsurface mineral ownership.